The Complexity Space | 3-D Change, Inc.
Ecosystem Levers identify four distinct, yet overlapping “levers for change.” Individually and collectively, these are areas in which organizations can introduce change in order to influence their existing patterns. The Complexity Space Flow recognizes that the gathering, integrating, and acting are constantly occurring, producing continuously emerging outcomes. This recognition provides a critical lens through which to view adaptive change initiatives. The Complexity Space Landscape offers a visualization of how organizations can define the current and desired states of three major patterns. The Complexity Space produces two types of complementary Outcomes. “What” outcomes focus on traditional, project-based measures of success. “How” outcomes focus attention on whether patterns are shifting in appropriate and useful ways. The Complexity Navigation Process provides a “roadmap” for teams, departments, and organizations to follow as they influence their complex systems towards their desired short- and long-term goals. 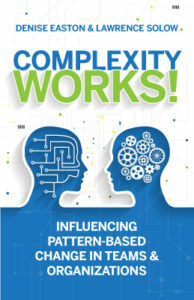 Visit http://thecomplexityspace.com to learn more about the Complexity Space.